Sardinia is a heady mix of rugged landscapes, bright white beaches and prehistoric ruins. As one of the largest islands in the Mediterranean, there’s plenty of coastline to go around. Cathedral-like Neptune’s Grotto and the Maddalena Archipelago decorate the north coast. 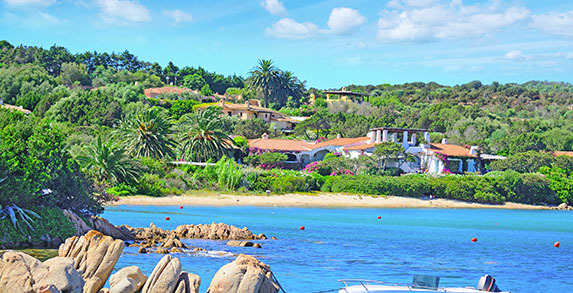 You could stay in the Costa Smeralda, where glamorous yachting towns and fishing villages sit side by side. Sink south for your pick of historic sites. Mysterious Su Nuraxi di Barumini is thought to date back to 2,000 BC, while Nora stacks Roman ruins by the sea. Just don’t overlook central Sardinia. This is top hiking country, with old-world villages set amongst stone canyons and soaring mountain peaks. This superb resort sits on the edge of Southern Sardinia and offers an extensive array of fine restaurants, chic bars, fun family facilities and seven hotels. Hidden in the northwest corner of Sardinia, shrouded in medieval history lies the town of Alghero. Despite being a hub for summer tourism, Alghero has done the impossible and retained its character. On the Western side of the island Cannigione is home to one of the best beaches on the island with golden sand that gently slopes into the bay offering great swimming and superb diving and snorkelling. This is one of the most picturesque bays in Sardinia – a title that’s not easy to earn. It’s an impressive sight of soft white sands that stretch up to 750 metres and up to 90 metres wide. Gentle slopes leading into the crystal-clear waters makes it a good choice for families and the land around the beach is protected, making it a nature-lover’s paradise. This isn’t technically one beach, but the picturesque coves and rugged seascapes of Maddelena are not to be missed. Just off the north of Sardinia, these seven scattered islands are only around a 20-minute ferry ride from Palau and boast hidden coves, long stretches of beach and rocky outcrops. Arutas stretches for several kilometres on Sardinia’s western coast and is made up of small grains of quartz in varying shades of pink, green and white. The affect is beautiful and its location makes it a popular choice for surfers. The sandy bay of Rena Bianca lies just 10 kilometres from Porto Cervo and boasts gently sloping white sands, watersports facilities and bars and restaurants within walking distance – making it a popular choice. Visit in May, June and September for quieter crowds. 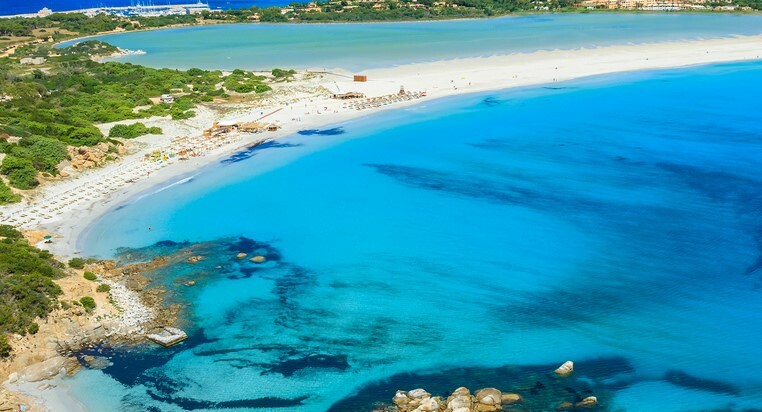 Le Pelosa beach is known for its shallow turquoise waters and incredible white-sands, framed by a view of Isola Piana and Isola Asinara that sit a few hundred metres out to sea. There’s a snack bar here for light refreshments and sun loungers to rent. Near the small village of Cala di Volpe on the glamourous Costa Smeralda, Principe beach is accessed by a ten- minute walk along a rocky path. The effort to get there is rewarded with a scene of soft sands, craggy rocks and crystal-clear waters that are perfect for snorkelling.